May 28, 2013, 10:18 AM · SeaWorld Orlando's largest-ever theme park investment, Antarctica: Empire of the Penguin has opened to huge crowds (with wait times typically exceeding two hours)… and mediocre reviews. Some fans have lauded the ride for its advanced ride system and intricate set detail. But others have ripped it [see comments] for lacking an engaging story and not delivering enough on-ride views of the attraction's stars -- SeaWorld's penguins. But could some of SeaWorld's early marketing efforts set the stage for public disappointment in its new ride? Many fans complained the Antarctica: Empire of the Penguin did not meet their expectations. What crafted the expectations that the ride itself failed to meet? Looks like fun, doesn't it? You'll ride in open vehicle, through a bright, open, live animal habitat, looking at penguins just a few feet away from you. Sliding across the ice, you might even get a little wet from a splash through water somewhere on the ride. And you'll also get a chance to walk into the animal habitat, getting even closer to the penguins, as the ride vehicles slide around you. You don't see live penguins on the ride until the very end, and they're not out on the ice with you, but kept instead behind a floor-to-ceiling panel of glass. Riders will get the chance to get closer to the penguins, without a barrier between them, but only after exiting the ride. SeaWorld's wisely timed the lighting inside the penguin habitat to approximate light levels in the real Antarctica. But in late May, that means a darkened environment for almost all of the day for the penguins -- not the bright setting that the park's promotional images portrayed. All this goes to show the risk that parks accept when they issue concept art for their upcoming attractions. Disney's John Hench was the master at creating such images, painting deceptively vague, impressionistic scenes that appeared to show great detail but in fact revealed little. SeaWorld showed its future visitors photorealistic detail in its promotional images for Antarctica -- details that did appear in the ride and its surrounding land, but not in the context relative to one another that visitors saw in that promotional image. That created expectations for an experience that the ride did not deliver, perhaps setting up many of those visitors for disappointment. May 28, 2013 at 10:45 AM · Personally I think that Theme Parks are onto a loser every time they open any new attraction. There is a world of difference between the 'ordinary' public and the theme park fan fraternity. The former turn up without expectations and simply take attractions at face value. The latter spend months or years second-guessing the designers, slavering over details and information, and generally building themselves into a frenzy.... It's hardly surprising that they then go online and complain that the attraction 'isn't what they expected'. May 28, 2013 at 10:48 AM · Many good points. May 28, 2013 at 11:06 AM · Well, by the description and the video I for one am extremely disappointed before I even experience the attraction once. I will definitely not be making a special trip for this. I am not surprised the attraction falls short of the concept art though. I've learned a great deal from all the hoopla surrounding Aquatica. Another SeaWorld let down. May 28, 2013 at 11:42 AM · Concept arts should be as close to the real attraction as possible to avoid a disappointment. 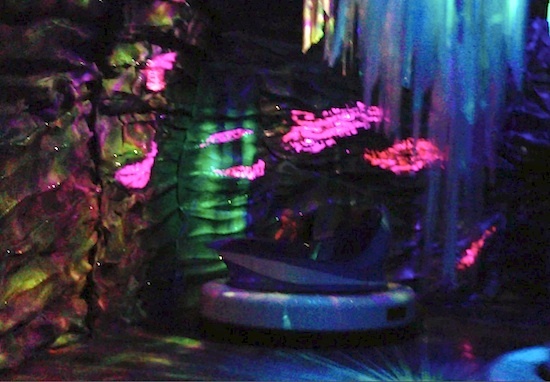 On the other hand, Antartica's ride looks so mediocre that they had no option than to make it look like a great ride. May 28, 2013 at 11:47 AM · This was right on point to exactly what I thought the minute I got off the ride. Nothing like I expected due to the concept art. The ride bored me. However, once you get off the ride and are able to view the penguins up close, spectacular! The exhibit itself was awesome, but the ride mediocre at best. May 28, 2013 at 11:51 AM · I never expected the ride to look like the concept art, but I'm sure some people fell for it. I simply expected better from SeaWorld, considering how much the trackless ride vehicles probably cost them. The flat screens really pulled you out of the experience and felt extremely cheap. The ride was also a bit short. They really should have used animatronics to give it a more personal and engaging feel. To me the whole experience just means I have to wait several hours to see the penguins. Then the temperatures somewhat force you to move along quickly. I preferred the old experience much better. Also, I think Sea World should have made a nice waiter service restaurant instead of another cafe. I've heard many online saying the food wasn't very good, which doesn't surprise me. SeaWorld's soft serve ice cream has no flavor to it at all. May 28, 2013 at 11:56 AM · I think David said all that needs to be said, but it's fairly clear this ride is marketed toward kids. May 28, 2013 at 12:37 PM · I too am disappointed with the misleading advertising. I envisioned a ride through the penguin enclosure, with penguins on either side of the boat separated by a glass barrier or something like that. It would have been really cool! We'll continue to visit SeaWorld because we do love the park, but Antarctica will not be "must see" on my list. May 28, 2013 at 12:43 PM · To me the ride was portrayed as a FAMILY ride!! Not an intense thrill ride but rather something everyone can enjoy... as far as the concept art goes, the art is only for promition not to tell you exactly how the ride will look..
May 28, 2013 at 1:27 PM · I wouldn't put the blame on the concept art because I think most people know better than to trust what they see in an artist's rendering. That being said, SeaWorld delivered a lot of hype for a product that looks, quite frankly, less than awe-inspiring. I was strongly thinking about tacking on a day to my upcoming Orlando trip to spend at SeaWorld when I heard about the trackless technology and the "immersive story telling" that SeaWorld promised. Any thoughts of that went right out the window when I saw the video. I just don't see what the big deal is: You go past some screens which tell a disjointed story, see some pretty icicles and then the ride is over? The penguin exhibit looks fantastic, but the ride? Huge disappointment, not just because of the hype...just because it looks like a poor ride. 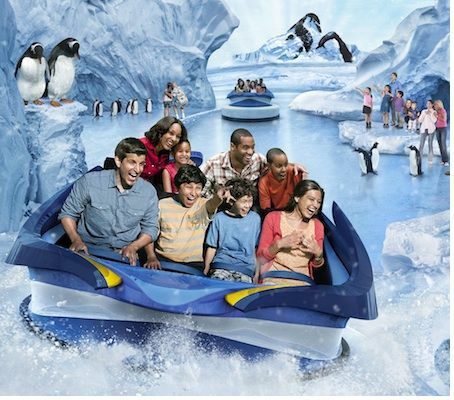 May 28, 2013 at 1:29 PM · True, the promotional image is highly deceptive, but the biggest issue with Antarctica is that it's simply a dud as a ride experience from what the video shows. I don't need to actually ride it to see that. There's nothing new or innovative about it outside of the trackless vehicles...which in themselves aren't all that impressive because they're not asked to do much. This is at best a very mediocre Disney-type experience on the level of The Seas with Nemo and Friends at Epcot and won't have me taking a day away from Disney or Universal. Conceptually, very lazy...how much was spent on this thing?? May 28, 2013 at 1:41 PM · That was not what I was expecting, seems like a let down. May 28, 2013 at 1:47 PM · I think people are being incredible hard on this new realm. I will try not to repeat what David already pointed out, as I agree that his post was right on point. "a first-of-its-kind family adventure ride that will include technology allowing for the experience to change from visit to visit. Guests will also be able to choose the “level of thrill” that they wish to experience inside the 8-passenger car. The attraction will introduce guests to a new SeaWorld character… a young gentoo penguin who will become your guide and lead you through a journey into the dangerous and wondrous beauty of the Antarctic. They’ll experience the mystery and wonder of life on the ice through the eyes of a penguin, sensing the beauty and drama of their often-dangerous habitat. Antarctica – Empire of the Penguin combines closer-then-ever animal connections with state-of-the-art interactive ride technologies"
That sounds exactly like what we got. Is the ride shorter than what some had hoped, sure- however I have heard that it is in fact a FUN ride none the less. Maybe the problem was the labeling of the art as CONCEPT- when it is more like PROMO. I also feel the need to out that the vehicle in the promo is clearly going through snow and not water- which I believe clued to viewer into the idea that this attraction will be cold! Maybe SeaWorld's latest press releases focused too much on the ride portion of this new realm instead of the realm as a whole- something that many web sites are also doing. Take TPI for example- we only received a ride review instead of an entire overview of the Antarctica realm. May 28, 2013 at 2:13 PM · I watched the POV video. It reminded me of E.T. with all those crazy flashing colors and dark atmosphere. We are spending one day at Sea World this year, but I can guarantee we won't be waiting hours to see this. I expected so much more from all the hype. May 28, 2013 at 3:13 PM · I, for one think this whole thing was blown way out of proportion than what it actually is. First off, Seaworld kept calling it a "realm", which made it seem like a very big and immersive new land (ie. Cars Land, Wizarding World). What we got was a small area with an extremely mediocre ride, a food court, a gift shop, and a place to get a drink. Compared to WWoHP in Islands of Adventure, they have 3 ride, numerous shops and dining opportunities, and an engaging LAND. If Seaworld really did want to make it seem like you were entering Antarctica, they should have put more effort into the surroundings to make it feel like you were actually at the bottom of the earth. Don't even get me started on the ride. For me it looks like you spend 4 hours in a line where they talk about the "story" of e puck and how you have to live the adventure with him now. However, Puck must have an extremely boring life if all he does is see cool icicles with his face in them, shiny colours, a frozen waterfall and an 'intense' encounter with a sea lion. (Which lasts a total of 20 seconds). The only interesting part me is the ending at the actual exhibit. Its too much to wait in a 4 hour line to be in a 3 minute ride with absolutely no legitimate plot. Waste of time, I will most definitely not be attending. Sorry Seaworld but you missed the boat. May 28, 2013 at 3:55 PM · Wasn't it unrealistic to assume that ride vehicles would move right through a penguin habitat? For one thing, how could they insure the safety of the animals? May 28, 2013 at 4:57 PM · David Brown writes: "There is a world of difference between the 'ordinary' public and the theme park fan fraternity." May 28, 2013 at 7:25 PM · Disney's Animal Kingdom Kilimanjaro Safari does an amazing job of making it seem like guests are actually in the same place with live wild animals, when in fact, that is mostly an illusion and the barriers are almost invisible. I "assumed" that Sea World would employee a similar magic to make it seem as if the ride vehicles passed through at least a couple points where real penguins could be seen. I think Robert could be right. 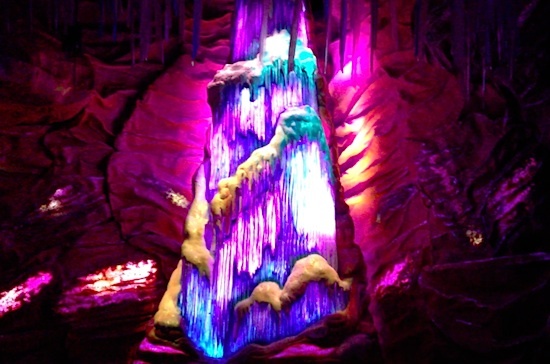 That promotional image conjured a journey through slippery majestic ice caverns and caves into a themed world with weather conditions and simulated sky overhead. I wanted to take a journey to a place I'm not likely to see in my own life. I didn't want to watch CGI videos. I expected more than one room with completely fake looking streamers hanging from the ceiling. It's cool in a trippy sort of way, but that part lasts less than a minute. The ride cars are great technology, but when they could have been used to make riders feel as if they're on water or ice, all they do is spin. This isn't supposed to be a thrill ride. Who cares if they spin a little or a lot? May 28, 2013 at 9:21 PM · Another dissapointing ride from sea world I guess. Shipwreck rapids, Atlantis and the helicopter ride are all mediocre rides at best. I was hoping this would be a game changer but I guess it's more of the same. Mediocre ride followed by a solid animal attraction. I disagree with the comments about theme park fans and the average visitor who brings no expectation into the rides. Before I was a theme park fan I experienced the aforementioned rides and they were all boring and dissapointing to me. I think anyone that has been to Universal or Disney can distinguish between the top quality theme park attractions and the mediocre. If not, then Sea world would have similar market share and attendance as Disney and Universal, which clearly it doesn't. This just shows that Sea world is not yet up to par with Disney and Universal. It's a shame, it would've been cool to have a "big 3" of theme parks. May 28, 2013 at 9:59 PM · I don't think the concept art is the issue, but more the amount of hyping SeaWorld did for this attraction. From everything that was said prior to opening, it certainly seemed like something on the scale of a Disney E ticket. I certainly never expected the attraction to be anything like the concept art, but I did expect a fully themed dark ride through an environment populated with animatronics and some live animals. The end product of a single room, a couple video screens, and a glimpse of the penguins through a window just falls far short of what many were expecting from the attraction. It's a shame, as I really thought this could be one of the best attractions in Florida. Unfortunately, when I finally get a chance to visit Florida and go to SeaWorld Orlando, Antarctica will be going under the "time permitting" list. May 28, 2013 at 11:10 PM · Haven't been, but just looking at the pov video here, what I see as the biggest fail is the use of flat screen movie clips as the meat of the story in the ride. Being used to the 3 dimensional feel of Disney animatronic dark rides, this felt cheap. This is a schizo ride which doesn't know what it is. First you are watching the movie, then you are in the 3D dark world of the movie, but then you keep going back to the movie. The only way a flat screen ride seems to work is in a Star Tours or Soaring type of venue, where it is always on the screen and you are not pulled out of the 3D effects to the flat screen over and over. And yes, the concept art looks nothing like what the experience is. Yes there are penguins, yes you see the trackless ride vehicle, but that is it. May 29, 2013 at 1:26 AM · It's Turtle Trek the Ride. It's not a bad attraction and the area is a great addition. I applaud Sea World for giving us this experience instead of being stagnant. However, it obviously doesn't compete with the Big 2's E tickets. I wouldn't want to wait more than 30 minutes for this. May 29, 2013 at 8:36 AM · Stood in line for 4 1/2 hours and was a bit disappointed. Ride itself isn't as advertised. No up close interaction with penguins. Most of the ride has you just spinning with not much to look at. Should have been more realistic in its advertising..
May 29, 2013 at 9:53 AM · Based on what I'm seeing, I'm estimating that the love/hate ratio on this one is about 1:3. So if we can get the three-fourths of people in the current 2-hour-plus line who won't end up liking it to just skip it, that'll leave about a 30-minute or so wait for the people who actually will enjoy this attraction. And at a 30-minute wait, I think this is a lovely, family-friendly addition to the park. May 29, 2013 at 2:33 PM · The thing that kills the ride for me, Lauren Alaina. May 29, 2013 at 10:33 PM · When you hear "biggest investment in park history" it makes you expect a lot. Maybe saying that, and if it were the case.... the fact that it was that.... made people have higher expectations to be impressed more than the end product actually did. May 30, 2013 at 4:56 AM · One thing: Seaworld has always dimmed the lights to simulate the darkened or brightened feel on the animals natural habitat. This really isn't anything new and happened within the original "Penguin Encounter"as far back as 1995 to my knowledge. Normally there was a sign posted explaining it, I can't speak for the new one but it's not a huge ride building so I didn't expect a massive ride myself. Either way, I'll reserve judgement until I see it for myself in the fall. May 30, 2013 at 11:48 AM · People complaining about not being able to interact with the penguins shouldn't because compared to the old area, this is a lot closer, and what did you expect? Being able to cuddle a penguin. Imagine what its like for these animals having to sit there, for 9-10 hours a day with people staring at them and little kids crying/screaming. Must be so uncomfortable and disorientating for them!